NOTES: When using Opec Colors such as orange, purple, pink, yellow, rasberry, and flourescent green you must use a white base coat to make the color bright. When using Metallic Colors you must use silver, gold, and copper base coats to bring out the metallic just like the real cars do. Airbrushing or using an airbrush is the best tool in painting thick finger nail polish. You can control the flow of paint and it is easy to clearn. You also must clean your airbrush after each color so you dont get spits of anohter color on the project you are going. If you do let it dry for 2 hours light sand it with the finist black water sandpaper and slowly remove it then try spraying again with light coats. 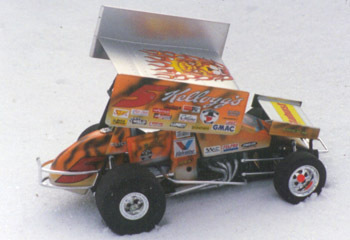 #5 Kelloggs Sprinter 1/18th GMP Die Cast kit The car was painted orange flourescent and yellow finger nail polish. The frame was painted black lacquer Duplicolor. The car was painted white lacquer for the base coat. After Orange flourescent was sprayed then added the yellow to front between the orange and white. The black stripes were black lacquer same as the frame. Then 6 light coats of the Duplicolor Lacquer clear was used. Terry Labonte #5 Kelloggs Slixx Decals were used to complete the car. #2 Vintage Sprint Car 1/18th scale GMP Die Cast kit The car was painted a white lacquer Duplicolor for the basecoat. Orange flourescent was sprayed on the nose section. The rasbuerry was feathered in the orange. Plum purple finger nail polish was used to frost the rasberry and orange. After dried 6 light coats of clear lacquer was used. 1/18 scale Slixx Decals of STP sprint car was used to finish the car. 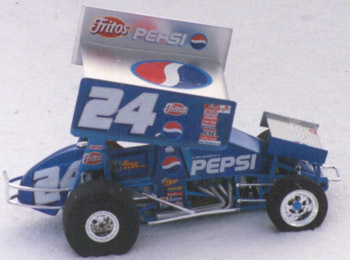 #24 Pepsi Sprinter 1/18th Scale G.M.P. Die Cast kit The car was done in blue with blue metallic flake finger nail polish. The frame was primed using Duplicolor primer. Base Coat-Clear Coat Sky blue was used to paint the frame and bottom wing. The dark blue was sprayed first then the blue metal flake was used next. After 25 minutes 6 light coats of Duplicolor clear was used. Jeff Gordon Busch Pepsi decals were used to finish the car.